The Audiosurf Flag is a jiggleboned item that attaches to Atlas and P-body's antenna. It bears a drawing of the Chell avatar found in AudioSurf. 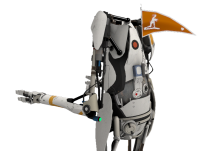 It was shown for a short time during the Portal 2 ARG and was awarded if the game was played the most out of the Potato Sack games. This page was last modified on 4 January 2012, at 09:45.